Today I wanted to do a set of a card and gift card holder! I used Kraft paper as the base cut with a Spellbinders Labels 8 then layer with a piece of red card stock cut two sizes down. I then cut green dot Spellbinders Lacey Pennants and then out of Kraft again the SB Pennant die. I stamped the Nativity Scene from O Holy Night and Nativity Bonus Stamp set found HERE. I used Ranger Embossing Ink and Black Opague Embossing Powder by Recollections. 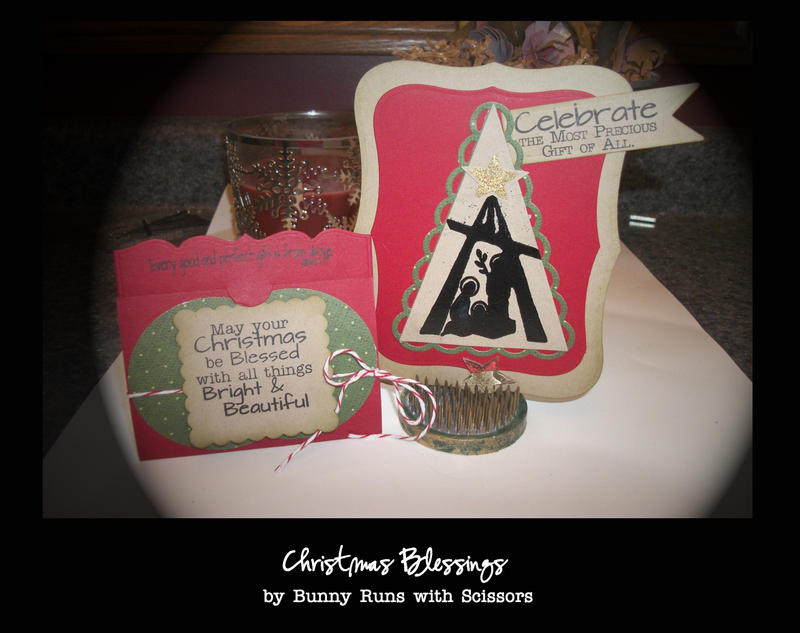 I stamped both Sentiments from Christmas Blessings Stamp Set found HERE in Jet Black Archival. The gift card holder die is from Emma at My Creative Time. I punched two 2 inch circles out of the green dot paper and layered a square scallop punch with the sentiment on top. The Cherry Divine Twine completes the look!